Ⅰ.China Statistical Yearbook on Culture and Related Industries 2018 is compiled by National Bureau of Statistics of China and Publicity Department of CPC Central Committee. 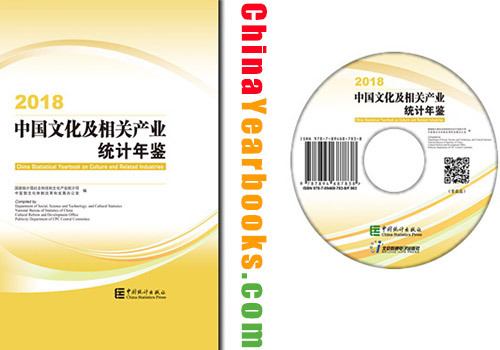 It covers data relevant with cultural industries for 2017 at national level and local level of province, autonomous region and municipality directly under the Central Government, and national key statistical data from 2005 to 2017.The yearbook is an annual statistical publication reflecting comprehensively the development and reform of culture of China. 4. Development of Main Cultural Industries; 5. Statistical Indicators of Hongkong, Macao and Taiwan of China; 6.International Statistical Indicators. Items Listing in World Cultural Heritage of China, Explanatory Notes on Main Statistical Indicators, Classification of Culture and related Industryies(2018) are listed as Appendices. Ⅲ.Statistical discrepancies on totals and relative figures due to rounding are not adjusted in the yearbook. Notations used in the yearbook: (blank space) indicates that the figure is not large enough to be measured with the smallest unit in the table, or data are unknown, or are not available; “#” indicates a major breakdown of the total. Ⅳ. Data in the yearbook are also source from the following departments: Ministry of Industry and Information Technology, Ministry of Civil Affairs, Ministry of Finance, Ministry of Housing and Urban-Rural Development, Ministry of Commerce, Ministry of Culture and Tourism, State Administration for Market Regulation, National Radio and Television Administraion, National Press and Publication Administration of the People’s Republic of China, China Film Administration, State Intellectual Property Office and the State Archives Administration. Here we want to express our deep appreciation to these departments!